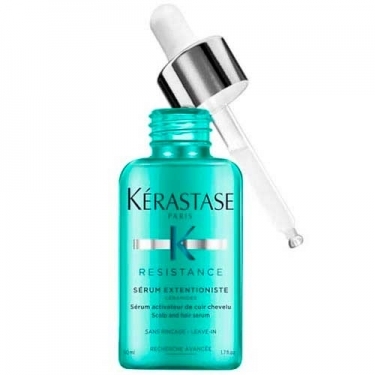 DESCRIPTION: Serum Extentioniste from Kérastase is a nourishing capillary serum that helps protect against breakage. The non-greasy formula uses a number of powerful ceramides to seal the cuticle of the hair, while a mixture of lipids creates a smooth surface, and provides a fortifying effect from the inside out. This highly concentrated serum forms a defensive barrier on the scalp to protect against harmful environmental aggressions while eliminating impurity. The hair will be strengthened, revitalized and improved.